Compared to NPK® G-series, the new U-cruncher shows important differences: one big center tooth. 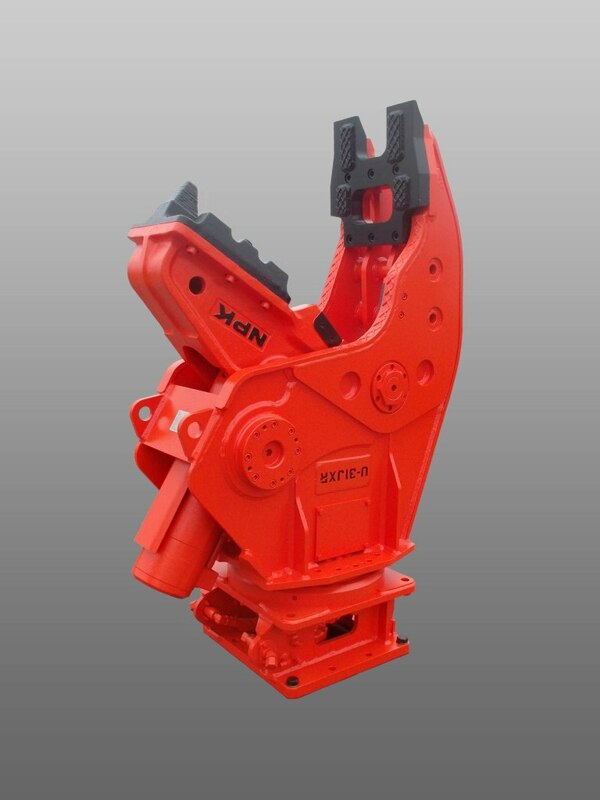 Because of the center tooth, all forces are concentrated to one point, which makes the U-cruncher act also as a crusher. Another advantage is the 360 degrees hydraulic rotation ( R ), allowing great manoeuvrability. Together with the center tooth and cutter the U-cruncher is an ideal tool for crushing and cutting walls, floors and light steel structures, such as apartments, reinforced walls, etc. Like all NPK® crushers and crunchers, the U-model has the standard integrated booster system, a unique feature designed by NPK®. This booster system automatically activates whenever the jaws meet resistance. This pressure intensifier system has a relatively low oil flow and produces faster cycle times and more crushing strength. Additionally, other excavators functions remain uninfluenced. The integral booster allows a compact body design, reduces the total weight of the attachment and affords ease of maintenance.